The pocket of houses bounded by Victory, Kester, Sepulveda and Vanowen is mostly neat, and well-kept, full of sturdy ranch houses and domestic bonhomie. But along unimproved Columbus slumminess prevails. 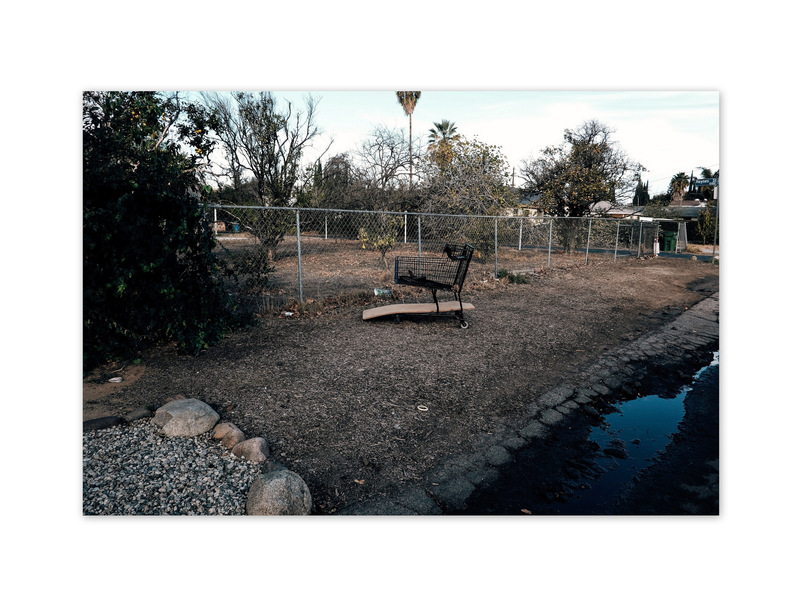 While there are remnants of rural Van Nuys, large parcels of land that once grew oranges and walnuts, most are now inhabited by abandoned or neglected houses, illegal dumping of cars, illegal businesses set up with nurseries, and others of dubious intent where tow trucks show up at 3am and weird men disappear behind locked, fenced gates. Each family home has been miserable in its own distinct way, to paraphrase Tolstoy. There was the hillbilly brigade that sold drugs out of their rental house, a group of oily zombies and hollow-eyed skeletons who threatened neighbors and broke the law hourly until the LAPD got in there after many years of surveillance and complaints. Now their lair is an empty house, just one of many on the street, in a city of homeless people and other working people who cannot afford to buy a house. At another house, last year, a homeless, addict owner of an auto body repair shop (yes there is such a being) moved into a foreclosed yellow ranch house at the corner of Kittridge and started buying the contents of storage lockers and piling them up and down his driveway and all around the property. He used the electricity left on by previous tenants and continued to collect couches, garbage containers, boxes, electronics, toys, furniture. All of it was stacked and crowded around the entire place from curb to front door. 50 or 60 emails and calls to Nury Martinez’s office as well as our LAPD Senior Lead Officers finally resulted in the eviction of the mad vagrant. It only took 12-18 months. After his arrest, yes AFTER his arrest, he was allowed to return to the house he had no right to be in, and he conducted his own criminal garage sale, selling off all the merchandise he hoarded. He is now gone and the electricity is turned off. 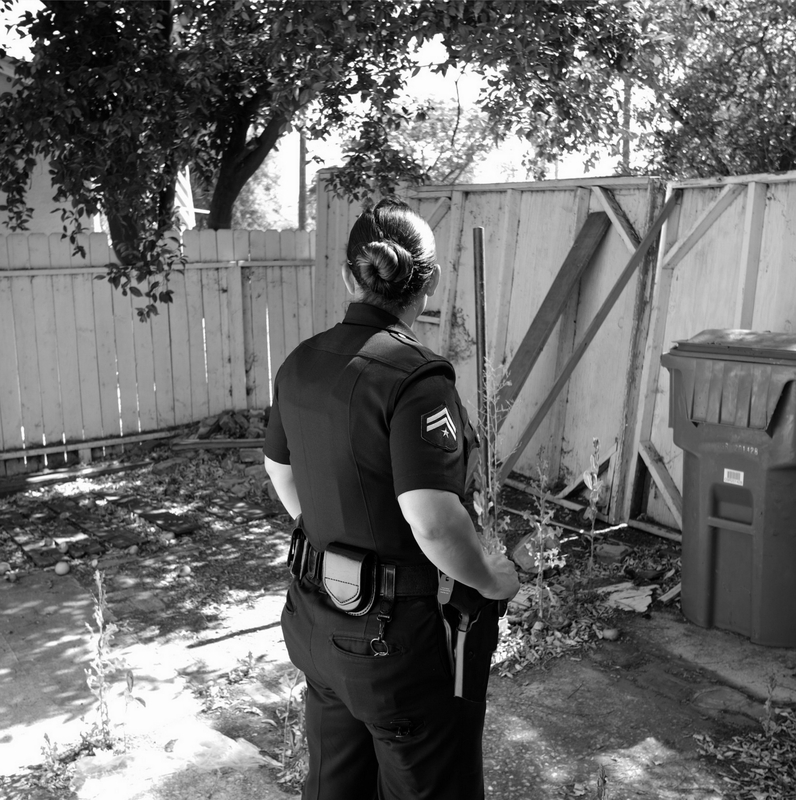 LAPD Sr. Lead Officer Kirk worked patiently, diligently and valiantly to contact city attorney’s and work with law enforcement to end the siege of the self-displaced person. The squeaky wheels who made the noise, all of us, were thankful to her. At Haynes Street, another man owned a home that he kept empty. It was stripped of its walls and plumbing, and allowed to denigrate into a trash strewn property with high grass, and many bottles and cans dumped everywhere. Eventually, it was bought by a bargain basement builder who axed large shade trees and is building a plain stucco box with vinyl windows. Better than before but now devoid of shade and character. Columbus at Hamlin looking south. 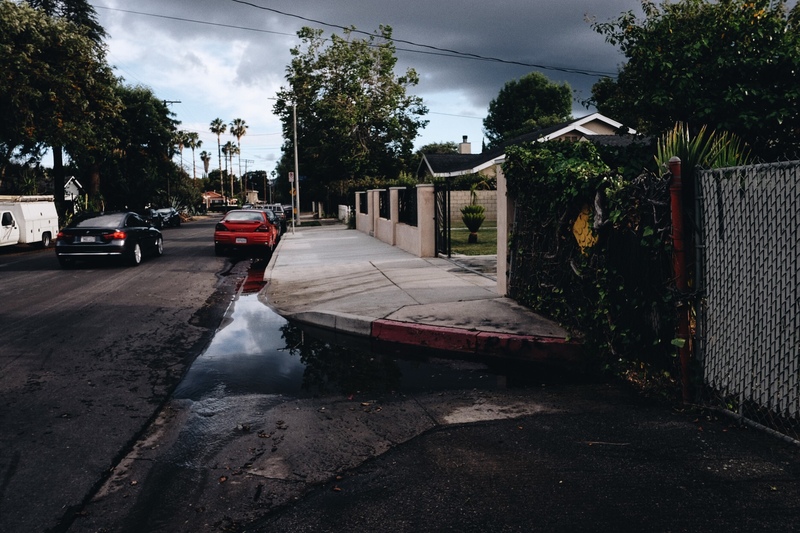 During rainy season, puddles form as the street has no sewers to drain rainwater. Last year, hope sprung up as one of the large properties, over 28,000 SF, was purchased by a Van Nuys architect/developer who concomitantly was also designing some large scale, mixed use retail/commercial buildings along Sepulveda and on Van Nuys Boulevard. VNNC Planning and Land Use arranged for residents to meet with the architect at his offices on Delano St. It was a civilized, courteous, nice evening of pizza and wine and drawings of the proposed homes, 4 or 5 of them. The architect took suggestions about design changes and again presented a second version of the houses at a later meeting. It seemed that the project was moving along. Bulldozers cleared the property which was also behind another under-construction apartment building on Sepulveda associated with the developer. Then a few days ago, a neighbor sent me a listing he found on Redfin. The 28,314 sf property where the new homes were to be built was up for sale. If a new buyer comes in and purchases the land for $1.1 million (it previously sold in 2011 for $320,000) she would not be building what the previous architect/builder had proposed. In an email to me the architect denied that the project was forestalled or cancelled. He claimed he had a disagreement with some partners and put the property up for sale to satisfy their demands. I believe a similiar situation happened to Mildred Pierce in 1945 and the end result was not good. In fairness to the architect/developer, whom I personally like, I hope his project continues. But the signs are not hopeful. Once again, what can only be called “The Columbus Curse” has come to pass. Sr. Lead Officer Erica Kirk, 2016. ← Observations Atop the 134 Bridge After the Storm.